This was our first cruise with Azamara and hopefully not our last. Azamara Pursuit was almost brand new when we sailed, so everything was shiny and new, but the senior officers and crew already seemed like one big family, who were genuinely happy to be aboard. We felt like we were coming home every time we re-boarded the ship. It is the perfect blend of sophisticated luxury and welcoming warmth. We departed from Athens at the same time as &apos;the Medicane&apos; struck - a Mediterranean hurricane! This was a very rare event and the weather was very unpredictable. Our captain Antonio and his team handled it beautifully, and with a very quick rescheduling of our first port of call we managed to avoid rough seas almost completely. All of the ports on this cruise were excellent, particularly Paros, Rhodes and Dubrovnik. The only downside was that we only had one sea-day and it was the very last day! Embarkation and disembarkation went smoothly almost without exception, including when we had tenders. We did a combination of Azamara shore tours and private tours. All of the Azamara tours were very good to excellent with the exception of Chania, when we were mostly on the bus and probably could have just spent the day in town. Entertainment on the ship is a group of four entertainers, who would provide two evening shows most days, plus a guest entertainer - a very funny comedian - who did two shows during the 11 night cruise. There was a band who performed in The Living Room most nights - they were pretty good but quite loud, which made conversation tricky. This was a good place to relax during the day too. The entertainer in The Den was a decent piano player but should have stuck to that (not so good with the singing!). We tried the specialty dining, Aqualina and Prime C. Aqualina was brilliant, attentive service, great menu and amazing food - worth the extra. Prime C was also enjoyable but the service was not quite as good and not as much variety, though granted it is a steak specialty restaurant so it&apos;s only reasonable to expect lots of meat on the menu! Having said that, the main dining room was also exceptional food and great service. 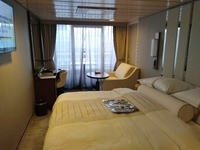 We had a verandah stateroom on Deck 8 and were very happy with it overall. It was very quiet and clean, and our room attendant was awesome. Plenty of storage and lots of hangers provided. Best of all, the bed was so comfortable! I think you can tell we enjoyed this cruise immensely. We can&apos;t wait to fist-bump the crew on our next Azamara cruise! This was our first cruise with Azamara and hopefully not our last. Azamara Pursuit was almost brand new when we sailed, so everything was shiny and new, but the senior officers and crew already seemed like one big family, who were genuinely happy to be aboard. We felt like we were coming home every time we re-boarded the ship. It is the perfect blend of sophisticated luxury and welcoming warmth. We departed from Athens at the same time as &apos;the Medicane&apos; struck - a Mediterranean hurricane! This was a very rare event and the weather was very unpredictable. Our captain Antonio and his team handled it beautifully, and with a very quick rescheduling of our first port of call we managed to avoid rough seas almost completely. All of the ports on this cruise were excellent, particularly Paros, Rhodes and Dubrovnik. The only downside was that we only had one sea-day and it was the very last day! Embarkation and disembarkation went smoothly almost without exception, including when we had tenders. We did a combination of Azamara shore tours and private tours. All of the Azamara tours were very good to excellent with the exception of Chania, when we were mostly on the bus and probably could have just spent the day in town. Entertainment on the ship is a group of four entertainers, who would provide two evening shows most days, plus a guest entertainer - a very funny comedian - who did two shows during the 11 night cruise. There was a band who performed in The Living Room most nights - they were pretty good but quite loud, which made conversation tricky. This was a good place to relax during the day too. The entertainer in The Den was a decent piano player but should have stuck to that (not so good with the singing!). We tried the specialty dining, Aqualina and Prime C. Aqualina was brilliant, attentive service, great menu and amazing food - worth the extra. Prime C was also enjoyable but the service was not quite as good and not as much variety, though granted it is a steak specialty restaurant so it&apos;s only reasonable to expect lots of meat on the menu! Having said that, the main dining room was also exceptional food and great service. We had a verandah stateroom on Deck 8 and were very happy with it overall. It was very quiet and clean, and our room attendant was awesome. Plenty of storage and lots of hangers provided. Best of all, the bed was so comfortable! I think you can tell we enjoyed this cruise immensely. We can&apos;t wait to fist-bump the crew on our next Azamara cruise! We can't wait to welcome you with a fist-bump back aboard! Thank you for the 5-star review, CherilynM! A good size cabin with ample storage, good layout and quality furnishings. Most comfortable bed on a cruise EVER. The mattress was amazing and I wanted to pack the pillow! Bathroom is small (but not the smallest I&apos;ve seen!) and very well soundproofed. We really didn&apos;t sit out on the balcony but still good to be able to pop out to see the ship docking or check out the view. Well, we thought it was just brilliant!